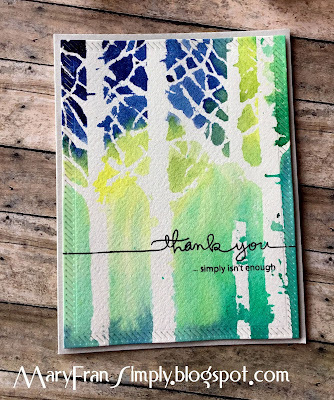 This is one of a few cards I am entering the Simon Says Stamp Challenge. This card was super easy. I used a stencil and dropped some Brusho crystals over it. I then sprayed water over this and activated the watercolor powder. I removed the stencil quickly so the water wouldn't seep under it and set it aside to dry. Once dry, I stamped the sentiment and adhered it to a gray card base. Thanks for reading this, and the materials used are listed below. Mama Elephant - Wishing You - "simply isn't enough"
Simon Says Stamp - Handwritten Borders "thank you"